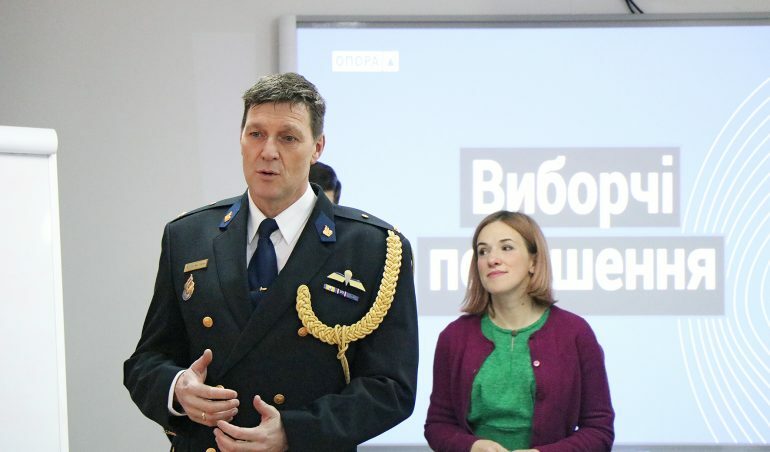 Last week, the European Union Advisory Mission (EUAM) launched the first of 15 electoral training sessions for police in Lviv region of Ukraine. A total of 375 patrol and district police officers, as well as representatives of the Main Police Department of Lviv region will undergo the training over the next three weeks. The course, initiated and financed by the EUAM, is being delivered by OPORA, the non-governmental organisation working in public oversight and advocacy in the field of elections. Participants on the training course will learn more about Ukrainian electoral legislation and potential violations that might occur during the ongoing 90-day electoral campaign, as well as on election day itself. The course covers subjects of the electoral process as defined by the ‘Law On Elections of the President of Ukraine’ and the ‘Code of Ukraine on Administrative Violations’. Alongside these subjects, police officers will learn how to classify electoral violations, as well as how to respond to them.